No matter what the reason you get cramps in the feet no one likes to be woke up in the middle of the night with a screaming cramp in your feet. Let's focus on some things we can do to help with cramps in feet. Foot Flexibility exercises and Foot Circulation exercises are a good place to start. Using the Stretch Band as shown here is a great way to increase the flexibility and strength in your feet at the same time. Tension the band just a little or a lot depending on your ability and begin to point your toes and ankles, then reverse flexing your toes then ankles. Add circles each direction as well. Repeat for 10 -20 repetitions or to fatigue. Make sure to keep the toes lined up evenly for best execution. 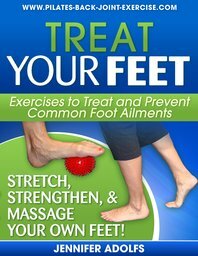 Find these and more Exercises to Treat and Prevent Foot Cramps in my new Foot Ebook here. 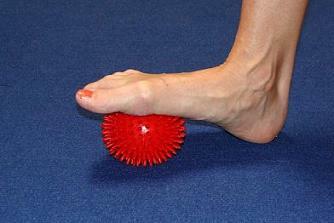 Using the massage ball helps to increase the circulation in the feet. It wakes the feet up hitting all the reflex points in the feet to stimulate circulation and better balance. I use this ball as a good Pilates for feet exercise to get my clients feet and ankles warmed up before their exercise session. Roll your foot over the ball up and down, cross wise over the ball of the foot and into the heel, then crisscross over the foot for about 1 minute each. Check out my video here describing this Pilates for feet and ankles exercise. This is my favorite quick and simple way to help keep the muscles of the feet and ankles strong flexible and me well balanced. And...next time you wake up in the middle of the night with cramps in the feet try this little home remedy. Keep a little baking soda by your bed, wet your finger dip it in and dab it on your tongue. Your cramp should dissipate in moments. Make sure you are staying hydrated throughout the day - and yes, even before bed. That's when we are the most dehydrated. Have a banana for a snack before bed to build up the minerals in the body that ward off cramps. Sleep well and with no more cramps in feet and check out more ways to help the feet here.